. Backlight Function: When the ON/OFF button is ON state, the backlight function can be operated by sound and motion sensor. You also can press the SNOOZE/LIGHT button open the backlight function when the ON/OFF button is OFF state. When connect charging cable, backlight function will be always in light state. 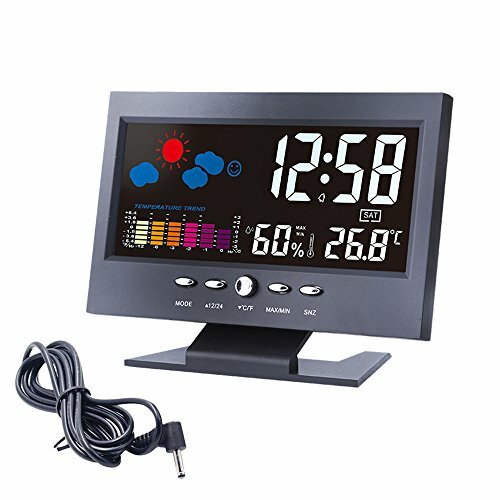 Weather and humidity monitor: You know clearly the air condition and you should take something if you go out. Change of humidity can let you know how to make a better diet. 5.Four-level weather forecast: sunny, half-sunny, cloudy, rainy. If you have any questions about this product by Ewtto, contact us by completing and submitting the form below. If you are looking for a specif part number, please include it with your message.